Since the tragic shooting in Las Vegas on Sunday, official reports have left Americans with no answers, yet these scathing discrepancies remain. Las Vegas, NV – The official narrative is that the alleged shooter, Stephen Paddock, a 64-year-old man from Mesquite, Nevada, opened fire on concert-goers located in a fairgrounds area on Las Vegas Boulevard from his room on the 32nd floor of the Mandalay Bay Hotel. The deadly shooting rampage in Las Vegas left at least 59 dead and over 500 injured. 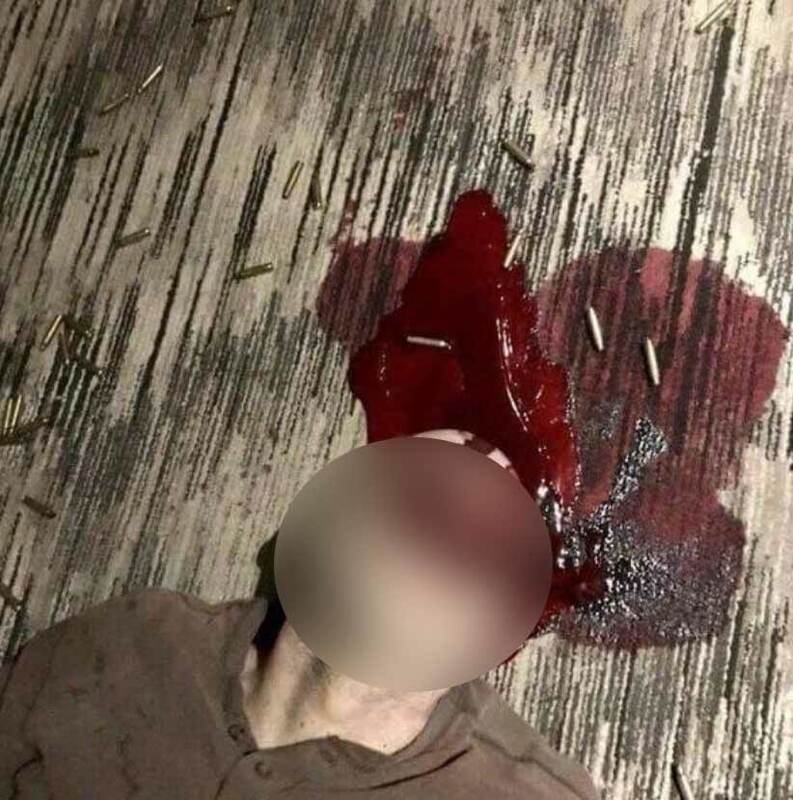 SWAT officers responded to the hotel room and used an explosive breach to enter the room and engage the suspect, but believe that he died of a self-inflicted gunshot wound prior to officers gaining access to the room. Police also confirmed that the shooter had cameras set up in his hotel room to monitor the hallways outside of his room, as well as to record himself during the attack. Police found 23 guns, ammunition, and a dead Paddock upon entering the grisly scene in his hotel room. Leaked photographs of the scene show Paddock lying dead on the hotel room floor with blood pouring from his mouth. Police say they do not yet have a motive for the mass killing. 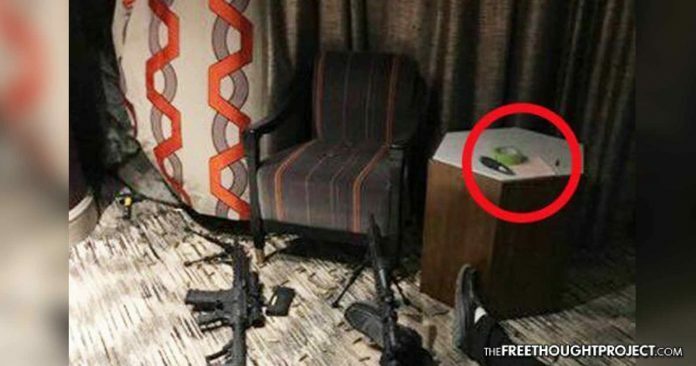 Interestingly, Paddock appears to have left some kind of note on the side table – which the police have yet to acknowledge or release the contents of. Subsequently, Paddock’s motives remain a mystery, with the millionaire property developer having no criminal history and not fitting the typical profile for a mass shooting suspect. In fact, he appears to have checked into the high roller hotel days before the devastating mass shooting, although no one claims to have seen him carry the numerous suitcases full of weapons and ammunition it would have taken to carry out the attack. Housekeepers said they “saw no signs of anything” suspicious, Nevada Rep. Dina Titus told CNN. Additionally, there has been no footage released of Paddock bringing the numerous suitcases of guns into the hotel. While this could be due to the ongoing investigation, releasing hotel security footage would seemingly quell a rising tide of disbelief in the official narrative. Keep in mind that Las Vegas hotels and casinos are some of the most thoroughly recorded areas in the country – with virtually every square inch being subject to monitoring by security cameras. In similar cases, often within the first 24-hours, police will at least release still images of the suspect captured by the building’s security cameras – yet there has been nothing of the sort released to date. Cops have repeatedly said investigations are ongoing and have yet to make public any details. Here are five good reasons to question the official narrative being sold to the public. 1. Photos of Stephen Paddock’s hotel room have been leaked, and one of those photos appears to show a suicide note. While there is no way to confirm this is actually a suicide note, regardless of what it is, why hasn’t the public been told what is in that note? Paddock was clearly seeking to send a message in his well-planned attack. So WHERE is the message? WHERE is the manifesto? No suicide note? As we previously reported, an interview with a witness raises startling questions, as the eyewitness claims to have seen a woman push her way to the first row of the concert roughly 45 minutes before the shooting began and levy threats indicating that everyone would soon be dead. “So there was a lady who pushed her way forward into the first row and she started messing with another lady. She told us we were all going to die tonight – it was about forty five minutes before the shots were fired,” the witness states. How did a 64-year-old man, not in peak physical condition, with “no military background” and who wasn’t a “gun guy at all” operate such advanced weapons in such a proficient manner? As Jon Rappoport has pointed out, it would have been virtually impossible logistically for Stephen Paddock to kill and wound 573 people in less than five minutes of shooting with the kinds of weapons that he is alleged to have used. While it is possible that many of the injuries were from the crowd trampling each other, the numbers for the shooting simply don’t add up. As we previously reported, a video, confirmed to be taken by a Las Vegas cab driver, appears to capture and confirm the presence of multiple shooters. Cori Langdon, taxi driver, and resident of Las Vegas was in the taxi lane at Mandalay Bay when the shooting began. At first, Langdon didn’t know what was going on, but when the shots began, she quickly realized and began filming. What she captured could be considered the most important evidence in regards to the reports of multiple shooters. While some will claim that these are just “conspiracy theories,” the reality is that every aspect must be critically analyzed and questioned, rather than making a quick rush to judgment. No one here is claiming to know what happened, we only want answers to all these loose ends. Please share this important information, and let us know your thoughts in the comments!